Revived from the pages of Harry “A” Chesler’s Punch Comics, Rocketman and Jetgirl take the stage solo to represent The Sentinels Of Justice this issue, as they continue to spar with The League Of Alternative Science. Giant, coed-napping vultures are the threat of the day, courtesy of Dr. Motmorency Watson, and his twisted technology. 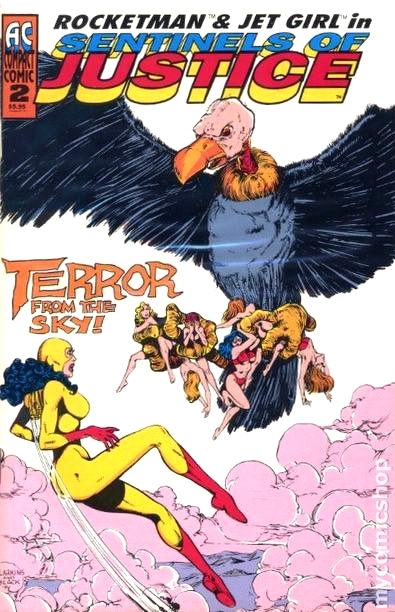 “Terror From The Sky” is written by Bill Black, drawn by Lee Larkins, and inked by Chris Allen. It guest stars Byron Foulger. Plus, another Golden Age backup, with a vintage reprint of Sterling Comic’s Captain Flash in “The Invaders”, with art by Mike Sekowsky and George Roussos. Color cover by Lee Larkins and Bill Black, the interiors are black and white and graytones. 36 pages, 6″ X 812/2″ compact comic size. Standard comic book format. Printed in 1994.